Like all the planets in our solar system, Earth and Mars orbit the sun. But Earth is closer to the sun, and therefore races along its orbit more quickly. Earth makes two trips around the sun in about the same amount of time that Mars takes to make one trip. So sometimes the two planets are on opposite sides of the sun, very far apart, and other times, Earth catches up with its neighbor and passes relatively close to it. 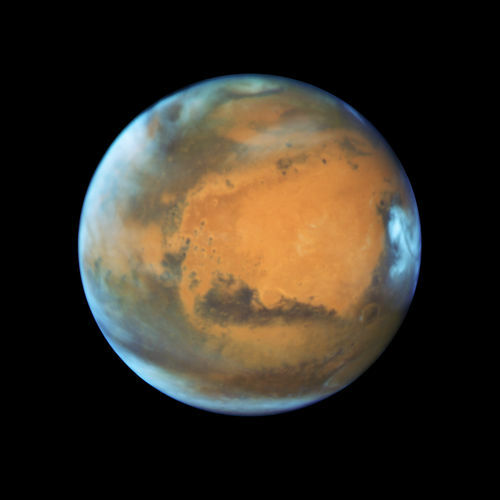 The Hubble telescope takes a Mars portrait near close approach. During opposition, Mars and the sun are on directly opposite sides of Earth. From our perspective on our spinning world, Mars rises in the east just as the sun sets in the west. Then, after staying up in the sky the entire night, Mars sets in the west just as the sun rises in the east. Since Mars and the sun appear on opposite sides of the sky, we say that Mars is in "opposition." If Earth and Mars followed perfectly circular orbits, opposition would be as close as the two planets could get. Of course, nothing about motion in space is quite that simple! Our orbits are actually elliptical (oval-shaped), and we travel a little closer to the sun at one end of our orbits than at the other end. Mars oppositions happen about every 26 months. Every 15 or 17 years, opposition occurs within a few weeks of Mars' perihelion (the point in its orbit when it is closest to the sun). This year, Mars opposition occurs on July 27, 2018. An opposition can occur anywhere along Mars' orbit. When it happens while the red planet is closest to the sun (called "perihelic opposition"), Mars is particularly close to Earth. If Earth and Mars both had perfectly stable orbits, then each perihelic opposition would bring the two planets as close as they could be. That's almost the way it is. But once again, nature throws in a few complications. Gravitational tugging by the other planets constantly changes the shape of our orbits a little bit. Giant Jupiter especially influences the orbit of Mars. Also, the orbits of Earth and Mars don't lie in quite the same plane. The paths the planets take around the sun are slightly tilted with respect to each other. So, with all these added factors, some perihelic oppositions bring us closer together than others. The 2003 opposition was the closest approach in almost 60,000 years! Mars' orbit is more elliptical than Earth's, so the difference between perihelion and aphelion is greater. Over the past centuries, Mars' orbit has been getting more and more elongated, carrying the planet even nearer to the sun at perihelion and even farther away at aphelion. So future perihelic oppositions will bring Earth and Mars even closer. But we'll still have bragging rights for awhile. Our 2003 record will stand until August 28, 2287!